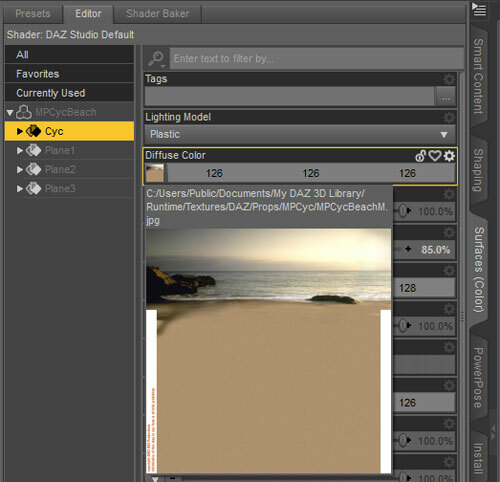 This tutorial deals with how to create simple environments in DAZ3D using the Beach. It is easy enough to Create Planes in DAZ3D and apply textures or photos to them for grounds and backgrounds. This is fine as long as you want a sharp 90% angle between the two, but it is no good if you want them to merge seamlessly into each other. There is a simple way to achieve this using the free Beach Environment which comes with DAZ3D. This has a slightly curved cyclorama at the back merging into a flat ground. 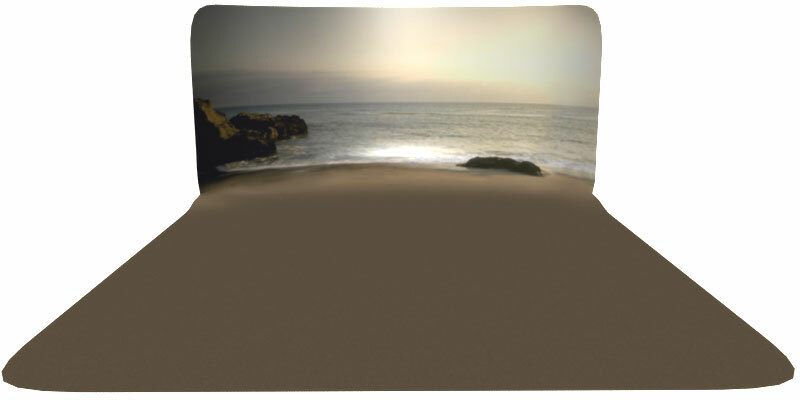 The Beach is located under Environments in Smart Content. 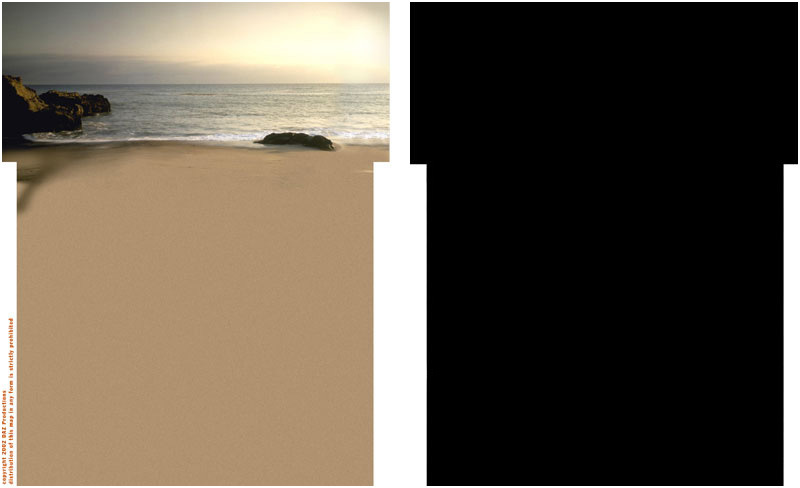 Open it and then in the Scene tab click on MPCycBeach > Cyc to reveal the three Planes. Hide each of these from view. You can't delete them without deleting the whole scene, so hiding them is the only option. I have not yet found a way of using them in alternative scenes. Now open the Surfaces (Color) tab and select Cyc (not MPCycBeach). Under Diffuse Color hover your cursor over the little image box on the left. This will give you the path to the image itself. Yours might be slightly different from mine. Navigate to the file and open MPCycBeachM in Photoshop or a similar image manipulation program. Use that image to create a black and white template which can then be used as the basis for all your own creations. Save it as a .jpg image in the same location. I gave mine the name MPCyc000 so that it is always at the top. The image is 2112 pixels wide, 2640 pixels high and 72 pixels/inch. 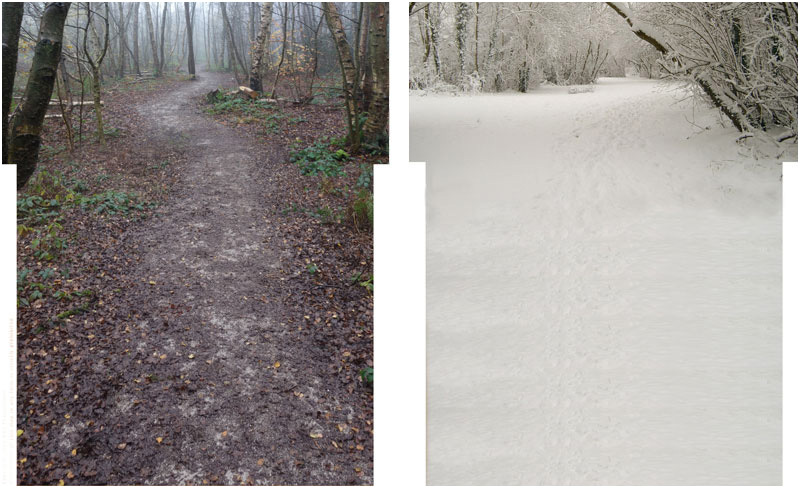 The slightly wider top section indicates where the background curves into the ground. You need to be aware of this when creating your images - anything below that will curve round and become part of the ground. This technique can also be used to add your own textures to many Wardrobe and other items in DAZ3D.